The Patriots suddenly find themselves in need of a backup quarterback. 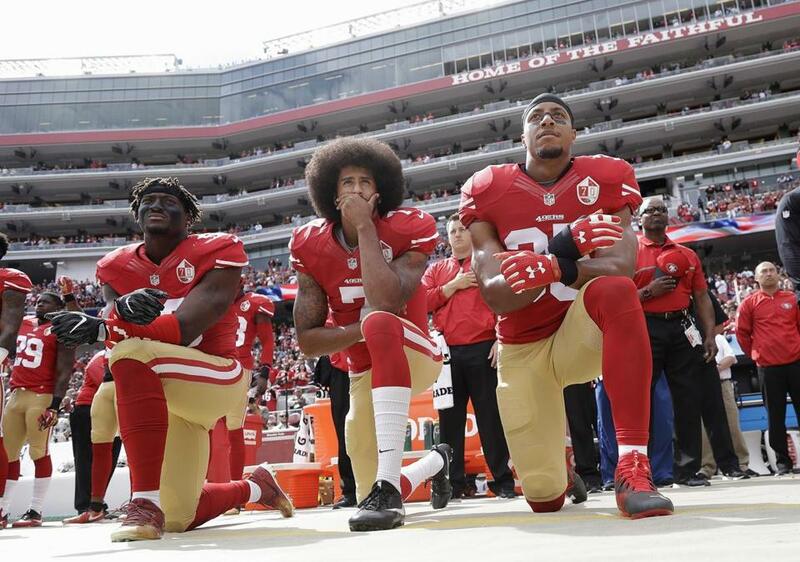 Here’s a thought: Sign Colin Kaepernick (center). Like many people who root for a team that is not the New England Patriots, I despise them. It’s a kinship that we, the fans of the 31 other NFL teams, share and enjoy. Now I could tell you it’s not the winning that we hate — that it’s some combination of cheating scandals, an imperious coach, and a fondness at the top of the organization for our rather unpopular president. But fundamentally it’s the winning. That’s sports, after all: We love our teams and grow to hate the teams that beat them again and again. But there’s one thing the Patriots could do that would turn my wild-faced, at least partly irrational hatred into grudging acceptance: Sign Colin Kaepernick. Right now, you’re either nodding in agreement, or you just set your computer on fire and are burning me in effigy while singing the national anthem at your desk. There’s not much middle ground. But on the off chance you can still read this through the sparking, melting mess that was your MacBook, hear me out. Kaepernick, whose cause swept the league after he kneeled during the anthem to protest racial inequality and police brutality, has been out of work since parting ways with the 49ers. And when the Patriots traded backup quarterback Jimmy Garoppolo to the 49ers on Monday night, the team was left without anything resembling a serviceable backup to Tom Brady. But this year, with the Chiefs and Steelers jockeying for position at the top of the AFC, finding someone who can fill in for a few weeks could be critical. What if Brady runs out of electrolyte powder and sprains an ankle? What if he gets suspended for secretly inserting homing beacons into the game balls such that they are magnetically attracted to Gronk’s solid-metal skull? Two games could be the difference between a top seed and a playoff bye and a divisional round date with the surprisingly spunky Bills or Jaguars. And while no backup could save the season if Brady is out all year — this isn’t a Bledsoe situation with this year’s uncharacteristically porous Patriots defense on the other side of the ball — it would sure be interesting to see what Bill Belichick could do with Kaepernick’s skill set. So there are pretty good football reasons for such a move. But the nonfootball reasons are at least as good. The movement Kaepernick started in 2016 has defined this year’s NFL season and triggered an ongoing feud with the president of the United States. So many players have knelt by now that if owners declined to employ all of them, there wouldn’t be much of a league left. So some owners, notably Jerry Jones in Dallas, quickly pivoted, co-opting a righteous protest against an obvious wrong into ill-defined, ham-handed displays of team- and league-wide unity. What are they unified around? . . . Unity! Such demonstrations look like little more than attempts to move the discussion away from the topics Kaepernick was clearly addressing. But assume for a minute that these calls for unity are sincere. Wouldn’t that mean that it’s time to welcome Kaepernick back into the fold? For the Patriots, whose coach, quarterback, and owner all expressed some level of support for Trump before he began attacking the league and suggesting fans boycott the games, signing Kaepernick to a backup role would represent real unity — the notion that through camaraderie and shared experience we can learn something from each other about the way others live in the country we share. And since the Patriots are widely seen as Team Trump, the act of signing Kaepernick would demonstrate to the league and the country that Kaepernick’s protest is not some unforgivable political sin, but an earnest stand against injustice that merits contemplation. Disagreeing with the method of the protest — something that America has been wrong-headedly doing at least since the days of bus boycotts and lunch counter sit-ins — doesn’t have to mean discrediting the person doing the protesting. On the Patriots and a handful of other teams — the Cowboys, the Texans — his signing might resonate not as a full-throated endorsement of everything about his protest, but of his right to speak his mind. To those who claim they’re boycotting the league over the protests, Kaepernick’s signing by the Patriots — whose leaders don’t appear to share Kaepernick’s views — would be hard to dismiss as political correctness. The Patriots are uniquely positioned to force people like me into grudging respect without further enraging the guy whose laptop is by now a charred husk. Instead, Kaepernick remains unsigned, apparently blackballed by a league desperate for even marginally competent quarterback play. On Monday night, Denver quarterback Trevor Siemian spent much of the game tossing the ball indiscriminately into vast expanses of unoccupied grass or people wearing the other team’s jerseys. Of course, if that’s what the Patriots are looking for in a backup, Brian Hoyer, who did the job once before, is available.